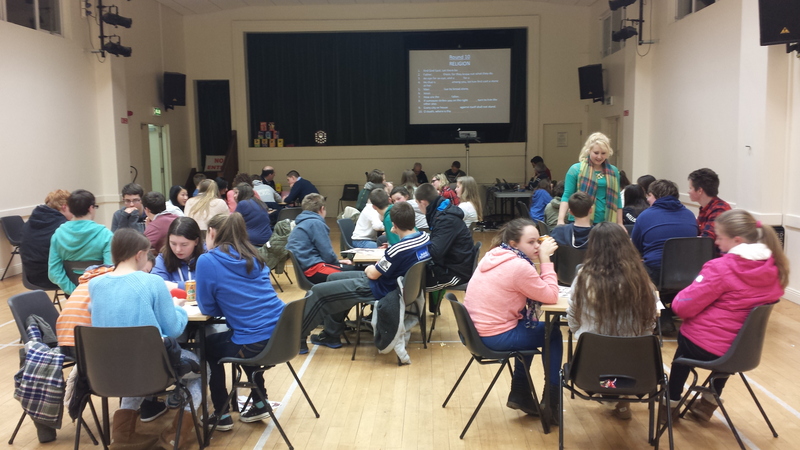 There was a great turn out for the annual CDYC (Cork Diocesan Youth Council) quiz on Saturday 7th March in Douglas, Cork. We had a great turn out of very intelligent young people at our Annual Table quiz on Saturday night, 7th March, with some very intense rounds! But it finally came to an end with Adam, Luke & Freddie from Midleton topping the leader board in our 15yr+ category and Ian, Aidan, Tom and Ashley from Rosscarbery topping the under 15yr leader board. So with a point between the 2 leaders the question being asked was “Is the Shield going to Midleton or Rosscarbery”? The West won! Well done Rosscarbery! A huge Thank you goes out to Uwe who manned the electrical and sound system for the night, Rev. Cliff Jeffers, Steven Jeffers and Norman Jackson for correcting and collating the results. Also to the Rev.Isobel Jackson, Peter Coughlan, the Rev. Sarah Marry and Kristin Hollowell and all the leaders that accompanied their youth groups for all their help and for joining in in the craic. Well done to all! This entry was posted in CDYC, Diocese, Youth Work. Bookmark the permalink.